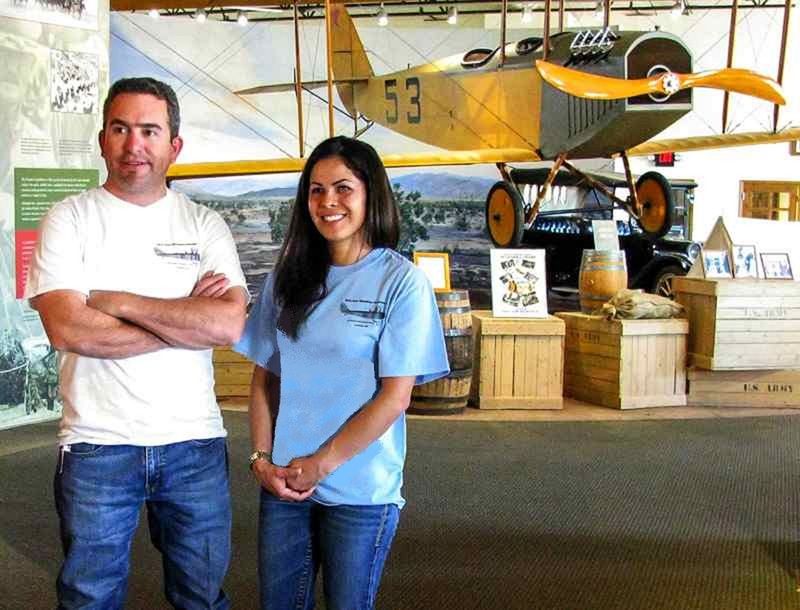 FASF Trustee, Bill Wallace III, of Columbus and Casas Grandes, Mexico, and FASF member, Maria Rangel, of Deming, NM, show off our new T-Shirt designs at the Pancho Villa State Park Exhibition Hall in front of the First Aero Squadron Jenny display. 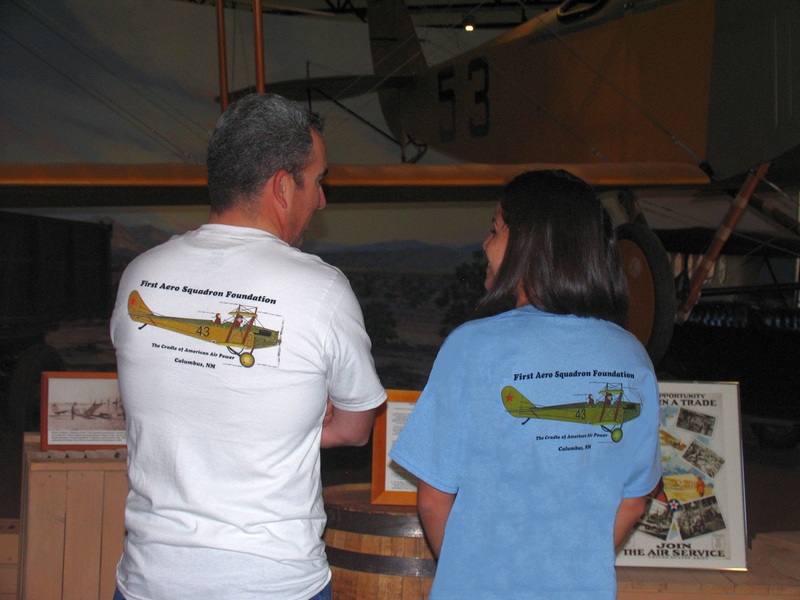 FASF Trustee, Bill Wallace III and FASF member, Maria Rangel of Deming, NM, try out our new T-Shirt designs at the Pancho Villa State Park Exhibit Hall. While Bill’s shirt was the right size, we were out of the correct size for Maria, so we made do with one a bit too large, but at least the photos show the new T-Shirt design well enough. We’re already running low so have just re-ordered more of the shirts and with small sizes for women. You can purchase the shirts by sending a check to the FASF at PO Box 1916; Columbus, NM 88029. Please state your desired size (S, M, L, XL, etc.) and color (choices are presently Blue or White). We are selling the new shirts for only $20 each, plus Shipping and Handling of $5 for a total cost of $25. Please send us your telephone number along with your check in case we have any questions about your order. Order now in time for the Christmas Holidays! Bill and Maria discussing the Jenny display and showing off the back of their shirt’s artistic Jenny depiction. Top photo was taken by your Aerodrome Staff and bottom taken by FASF member, John Read. This entry was posted in INSIGHTS - Our Colorful Members on November 9, 2015 by FASFRIC. Are there any plans for the 100 year anniversary of the Army of the North raid on Columbus? I am trying to get some of the 17th Infantry at Ft. Bliss to come and look around during the anniversary since they were down in Mexico at the time. Bruce – Thanks for your input – – – and question. There are many plans going on for the big Centennial this coming March. The Columbus Historical Society will be holding their regular memorial ceremonies on the 9th of March 2016, and the rest of us historically oriented organizations will be putting on our events the 12th of March, which is a Saturday. Your idea of rounding up some of Ft. Bliss’ 17th is a great one. As you likely know, the Fort’s Sergeant Majors Academy students come over here quite often to study what took place where the action took place 99 years ago. They are usually under the guidance of the Academy’s Historian, Dr. Bob Bouilly, as you may know. He might be able to help you in making any plans.